Munster prop John Hayes is set to call time on his rugby career following their Boxing Day match against Connacht at Thomond Park. The 38-year-old had originally planned to hang up his boots at the end of last season following Munster's Celtic league triumph, but with the World Cup dominating proceedings at the start of the 2011-12 season, Hayes committed to a short-term deal. And with 211 province appearances to his name - which included two Heineken Cup titles - Hayes will bow out on December 26. 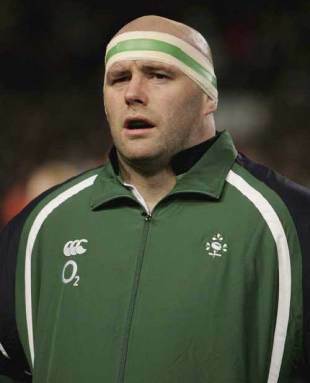 And former team-mate Alan Quinlan has paid tribute to the 105-cap Ireland prop. "The first time Hayes and I played against each other, the try was still only worth four points. Clanwilliam beat Bruff in a Munster Junior Cup match back in 1992 and Hayes was playing second-row," Quinlan wrote in his column for the Irish Times. "He was useless that day, clearly a man with the footballing ability for the front row and nowhere else. "The whole of Ireland can see that he had no interest in attention, that all he ever wanted was to get on with the job. He's very humble and respectful and all the things most people think he is, but he's very funny too and he'd do anything for you. And I do mean anything. "When I had my dislocated shoulder in Australia during the 2003 World Cup, I couldn't reach around to wash my own back. Hayes never blinked - he scrubbed my back for me for the rest of that tournament. Talk about above and beyond the call of duty. "I'll be there for his send-off on Monday and, hopefully, we'll be able to slip off and have a quiet pint when it's all over."